The medieval symbol of the Trinity, drawing taken from ancient incunabula and cathedrals. Ring ename.. The jewel to be seen in on an especially dark and different night, an opulently glittering repost to..
A druid's ritual ring; the positive supernatural powers of the pentagram under Celtic influence.A di.. The most direct and manifest statement of attitude, the famous blank, stark expression of the face o.. 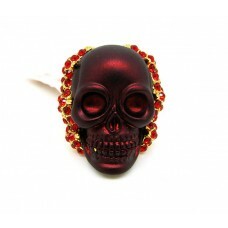 Very large skull with a matte dark red satin finish. On the sides two decorations consisting of a pa..
Ring in black leather. 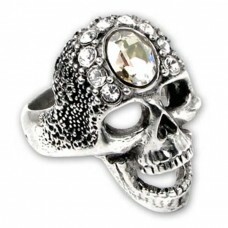 It has small silver-colored studs and in the middle three ogives (like bullet..
Rock or Pirate style ring in mirror-polished goldtone steel, depicting a skull. 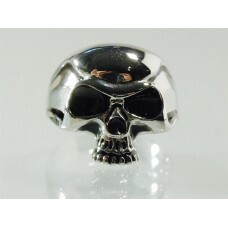 The skull has black-..
Rock or Pirate-style ring in mirror-polished steel, depicting a skull. 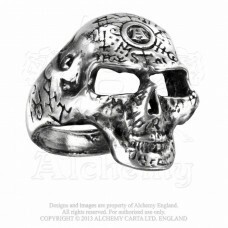 The skull has black-enameled ..
Steel ring, like a college but a bit gothic. 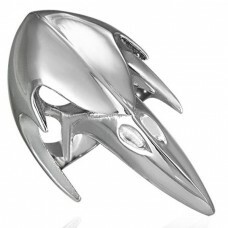 It has black glazes and a faceted crystal in the center..
Steel ring that depicts a large dark, rock, or gothic bird. 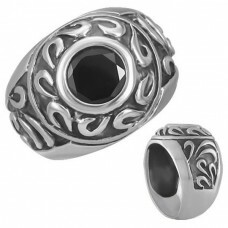 He is aggressive and with a bad expressi..
Steel band ring with a large Gothic or Templar cross in the center and two small side crosses. 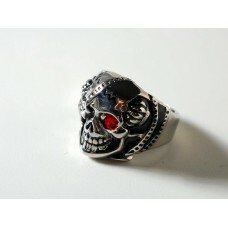 The t..
Steel ring with skull. One of the eyes has a large faceted red blood crystal. The other is covered w..